Here's the first beer in the Magnificent Mullet Series from Moon Dog. These guys make some awesome beers so this range of fruit infused wheat beers should be interesting. If you've got nothing to do check out the label guide on their website here, it's pretty cool. 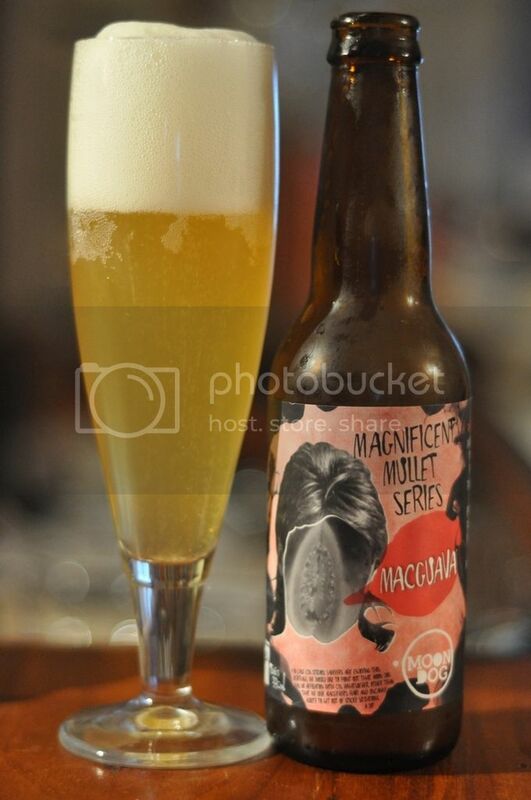 When you pour the Macguava you see this big white head that emerges forth from the bottle. The colour of the beer is a very pale straw colour, it's quite similar to pineapple juice actually. Unusually for a Berliner Weissbier the head has excellent retention, almost a whole finger is left for most of drinking. The head also leaves a thick wall of lacing down the entire glass. It's a very impressive start! I'm quite intrigued as I smell this beer, you can just tell this isn't your average sweet fruit beer. The tartness of this beer really comes across on the nose. There is some guava on the nose but not as much as I expected, there is also a slight citrus zest. The real bitterness comes from the lactobacillus yeast, which is typical of a Berliner Weissbier. As the beer warms up you can begin to taste a grape like flavour, it's definitely a different take on a fruit beer. The Macguava is a really different take on a fruit beer and I think it's going to make it appeal to a wider variety of drinkers. This beer is very much a nice bitter Berliner Weissbier with relatively sour guava added after. I can taste other muted tropical fruit flavours as well. But the real star of this be is the lactobacillus yeast which provides a very nice base for this fruit beer. Moon Dog have produced a really interesting beer here. This is one you are really going to have to taste for yourself to know if you will like it. However if you are a fan of Berliner Weissbiers I don't think you will be disappointed. I'm really looking forward to the Melon Gibson now, it'll probably follow later in the week. This is one I'd buy again, it's very interesting having a fruit beer with close to no sweetness. Absolutely worth a shot.